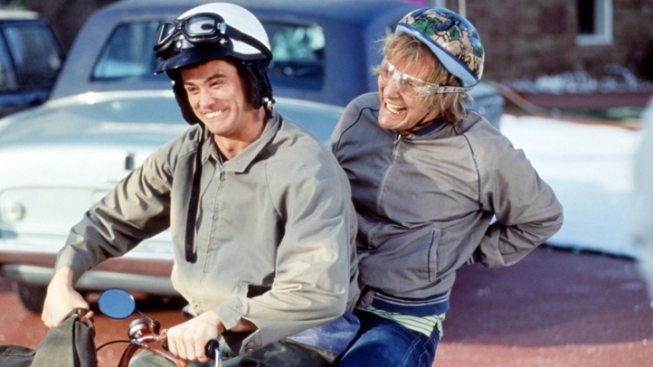 The sequel will star Jim Carrey, 50, and Jeff Daniels, 57. Just when you thought sequels couldn’t get any stupider, directing duo Peter and Bobby Farrelly confirmed that they will start shooting “Dumb and Dumber 2” this year. The flick has been in the works for a while — it was announced in October that Sean Anders and John Morris (who wrote "Hot Tub Time Machine" and Carrey’s "Mr. Popper’s Penguins") were hired to write the script. But aside from a few stray hints from Carrey, word on the sequel has been scarce until now. According to Farrelly, the new film, starring Carrey, 50, and Daniels, 57, has nothing to do with the 2003 prequel, “Dumb and Dumberer: When Harry Met Lloyd,” which starred Eric Christian Olsen and Derek Richardson. "We did not do 'Dumb and Dumberer,'" Farrelly said. "That was a studio thing. We've always wanted to do a sequel and finally Jim called up. Jeff always wanted to do it. We always wanted to do it. Jim was busy, but he called and said, 'We've got to do this thing again.' He had just watched ‘Dumb and Dumber’ and he said, 'This is the perfect sequel. Let's do it.'"